My first project at V2_Lab! DataCloud 2.0 is a dynamic webapplication and research project with it's focus on "information spaces" and "data visualisation". Users can add media objects (pictures or texts etc.) and add comments to them. 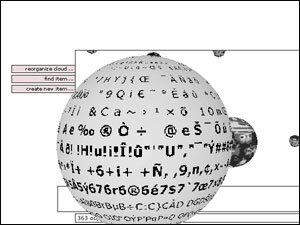 These media objects are visualized as spheres in a 3D space, and they can be reorganized based on their metadata. When DataCloud 1 was finished the makers started wondering about a 3 dimensional space. The idea was that it would enable them to show more relations between the objects. 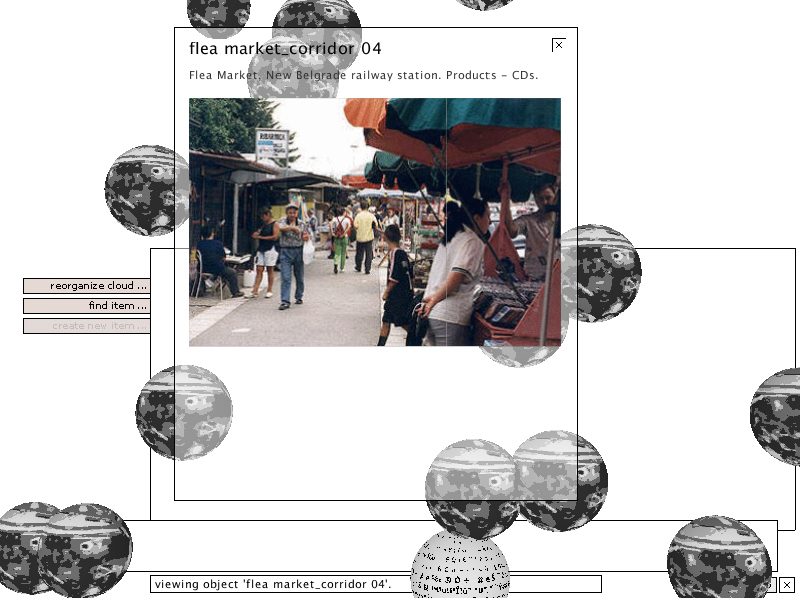 Also the visualization of the DataCloud information space would benefit from the way we perceive things in the real world: You see more detail of objects close to you, than of those at a larger distance. A lot of effort went into trying to implement Lenno's beautiful design! It has this sort of sketchy look and I really like the transparant layers, but this also meant that all the 2D screens and buttons etc. had to be implemented in the 3D world, causing me many learning moments. 3d object overlapping a 2d element While working on DataCloud you have to wonder about the usefullness of 3D. Is it really usefull or is it just fun? How 3D is 3D if it is projected on a 2D screen? Do users need different tools for interaction and navigation at different distances. Do they really need a floor and shadows to experience space? Will it be different for them kids that grow up playing doom and flying in flight simulators? Reorganization enables the user to look at theit data in another way. 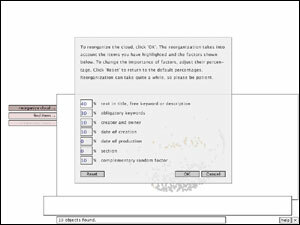 The user could define a cocktail of parameters. According to this cocktail affinity values are calculated between the media objects. These values cause either a pull or push force, and this way objects that are similar will end up close to each other, forming clusters, while objects with less in common will be placed further away. Though it worked correctly, there were some flaws. The clusters that occurred seemed to provide useful information at a large distance, but from up close the user would be confronted with quite an initimidating "wall" of spheres. 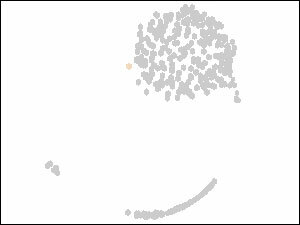 Also I didn't like the idea of mapping the objects on the surface of a sphere. In my mind they ought to be mapped in a volume to really use the space. The DataCloud 2.0 project was a huge challenge to me in many ways and I learned a great many things! The project offered me more problems than I could handle, but most of them were problems I didn't mind thinking about. A lot of the ideas that came up in the project reoccurred in other projects, which I interpret as a good sign :-). The DataCloud 2.0 project was continued by the DataCloud 2.5 project.